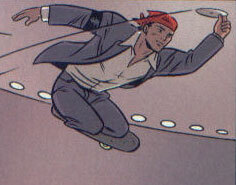 Powers/Abilities: El Guapo could fly through the air on his skateboard, presumably through a form of telekinesis or some other form of levitation. El Guapo could also cause the board alone to fly, without him on it. It also appeared that he shared some sort of psychic link with his skateboard, which seemed to have a mind of its own. History: (X-Statix#9) - When X-Statix visited the set of their movie-in-progress, the director revealed that the plot revolved around Dead Girl being driven insanely jealous by the Anarchists love affair with U-Go Girl and eventually El Guapo. 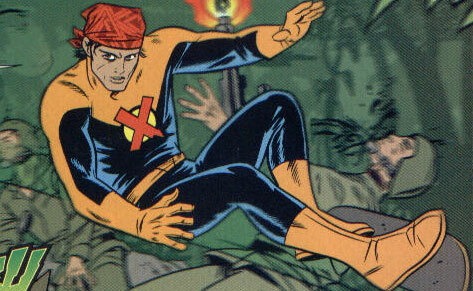 The Orphan claimed that there had never been an X-Forcer or X-Statix member called El Guapo. The director then explained that he wanted to include a Latin presence to the team in the movie and introduced them to Robbie Rodriguez, an actor who also happened to be the mutant called El Guapo. Later, when Sharon Ginsberg attacked the movie set seeking to destroy X-Statix, she battled the Orphan furiously until El Guapo arrived and whacked her on the head with his skateboard, knocking her unconscious. 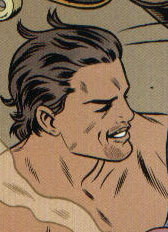 After the battle, X-Statix discussed the possibility of allowing El Guapo to join X-Statix. (X-Statix#11) - El Guapo awoke after a night with his girlfriend, Consuela, and his skateboard. As he opened the door, a limo was waiting for him to take him to a meeting with Spike Freeman. At the meeting, in which both movie director Kevin Smith and Wolverine attended, Spike offered El Guapo a place on X-Statix. El Guapo readily accepted and almost as soon as he did, the team was called on a mission to Malaysia. Venus Dee Milo jumped into action and teleported X-Statix, along with El Guapo, to Malaysia, where Guapo injured his knee and slammed into a tree while flying on his skateboard. The team later teleported back to base, accidentally leaving the board behind, but while recovering from his wounds, El Guapo deliriously called out for it. Later, after his board was retrieved from Malaysia, X-Statix explained to Robbie that once he joined X-Statix, the only way out was in a body bag. Guapo then met with Consuela to discuss his membership in the team, claiming that she didnt have to worry about him dying because he was El Guapo and he was lucky. That night, Vivisector and Phat overhead loud noises emanating from El Guapos room. In the weeks that followed, El Guapo learned how to communicate with Doop, and cheated on his girlfriend, all the while unknowingly under the video surveillance of Doop himself. Once Doops photos were made public in the Sleaze to Pleaze News tabloid, El Guapo attacked Doop, only to be stopped by the rest of X-Statix. That night, back in his room, El Guapos skateboard smacked him around a bit for cheating on his girlfriend. (X-Statix#12) - El Guapo joined X-Statix on a mission to the India/Pakistan border and later relaxed by the television as the team watched Dead Girl at her first modeling shoot. When the daughter of the teams coroner went on a shooting spree, El Guapo, along with the rest of X-Statix were called in to stop her. El Guapo was later present when Dead Girl ripped out the heart of Brad Gutman, the teams coroner, upon finding out that he was a necrophiliac. He then joined the team as they returned to the India/Pakistan border to lay those killed in the battle to rest. (X-Statix#13) - El Guapo was present when X-Statix was briefed on their mission to rescue the recently resurrected pop star Henrietta Hunter. He then joined the team during their rescue mission. Later, El Guapo was present when the Euro-Trash attacked and kidnapped Henrietta. (X-Statix#14) - During the battle that ensued between the Euro-Trash and X-Statix, El Guapo battled Oxford Blue until Surrender Monkey suggested that the Euro-Trash retreat inside an X-Statix Store in New York City. When Doop revealed that Spike Freeman was in contact with Europan government agents Dicky and Reggie, El Guapo tied Spike up and left him as X-Statix teleported into battle once again with the Euro-Trash. As the battle raged on, Blind Ali attempted to kill Henrietta. After much struggle with his conscious, El Guapo allowed his skateboard to fly towards Blind Ali, decapitating Ali. Once the battle was over and Henrietta was saved, the team spoke to the press about Henrietta, who expressed her desire to alter the X-Statix costumes. As Henrietta began her charity work, X-Statix decided that they should have killed her in the first place and set out to make sure she died. (X-Statix#15) - El Guapo was present as X-Statix discussed their plans to kill Henrietta Hunter and also joined them when they boarded Henriettas yacht, only to be interrupted by Lacuna. Lacuna convinced X-Statix once again not to kill Henrietta. The team decided instead to have Henrietta join the team. Upon her arrival onto the team, X-Statix traveled to Afghanistan to rescue the cast and crew of a reality show, who had been kidnapped by Taliban militants. During the battle, Phat used his powers to phat-up and deflect a missile fired at him. Unfortunately, the missile crashed into the ground, creating an explosion that cost El Guapo his legs. 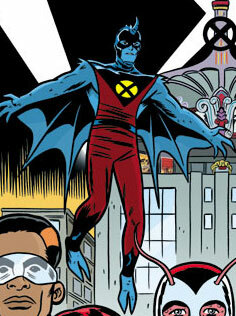 (X-Statix#16) - El Guapo participated in a modeling shoot, in which they modeled Henrietta Hunters newly redesigned X-Statix costumes. (X-Statix#18) - Upon the deaths of Phat and Henrietta Hunter at the hands of Mister Code, X-Statix held a private funeral for Phat, in which El Guapo attended. El Guapo later joined the team as they busted in on Henriettas record company. The company had released a new single by Henrietta that was mysteriously killing anyone who sang the lyrics out loud. The record exec suffered a fatal heart attack upon the teams arrival, however, as he had been singing the song prior to their arrival. Back at the HQ, El Guapo sang Henriettas new single until he was startled by the walking corpse of Henrietta and crashed into a plate glass window, impaling himself on his own skateboard. El Guapo means "the Lady's Man" in Spanish. I thought it was interesting that Robbie Rodriguez was originally going to be a mutant called the Horn, as seen in many early previews of the X-Force book, as well as the 1st X-Force TPB. I thought for those interested, I'd include an image of what Robbie would have looked like as the Horn. el Tigre, alias used by Sabretooth, @ Wolverine II#? ?